In advance of our first Light, Technology, Design event this Thursday that features the work of Russel Abraham, master architectural photographer, I wanted to share some connections that I uncovered after seeing his draft presentation a couple of weeks ago. The first idea I wanted to hold forth about is that of mastery. Russell, like most of us, would be reluctant to confer upon himself the title of “master,” so I have gone ahead and done that for him, because for me the idea of mastery is something very specific, has long historical precedent that we could stand to review today, and is intimately connected with craft, a concept that has rather fallen into disfavor in the wake of modernism. Let’s take for instance, Renaissance painting in Florence in the age of the Medicis, the mid to late 1400s. In Florentine culture, a master was someone who had made a name for himself (there weren’t many recognized women masters unfortunately) by accomplishing works of vision and great beauty. But in order to do this, he had to at first become familiar with the tools and technologies available at the time. This involved much time learning to grind pigments, smelt metal, prepare surfaces, carve marble, make brushes, even raising chickens and rabbits in order to obtain the raw materials for paints and glues. It also meant spending much time copying and learning from older masters. The time scale of the transfer of knowledge and attention to tools doesn’t have much corollary today, when our access to knowledge is so fast, expansive and rich, and people entering professions don’t have any real idea of what they want to or need to master. One connection between photography and architecture we forget is the term for photography’s main tool – the camera. Camera is a Latin word that means “room,” because the first cameras were actually rooms. The term for this was “camera obscura” literally, dark room. Camerae obscurae with a lens in the opening have been used since the second half of the 16th century and became popular as an aid for drawing and painting. The camera obscura box was developed further into the photographic camera in the first half of the 19th century when camera obscura boxes were used to expose light-sensitive materials to the projected image. Artist David Hockney and physicist David M. Falco advanced a widely accepted theory that advances in realism and accuracy in painting were due to the use of the camera obscura, camera lucida and curved mirrors. So strangely enough, the practice of architectural photography, communicating the experience of architecture, has its origins in architecture itself, quite literally. Buildings, or dark rooms, at least, could be used to generate images. In their talk, Russell and Kristen explain that the way we experience the world visually is that we’re constantly shifting our focus dynamically, that if we fix our eyes in one place, we’re using our foveal vision mostly to bring things directly in front of us into sharp focus. Peripheral vision is important too, and responds to different stimuli in order to direct the brain where to send the focused vision next. So seeing is a completely dynamic experience, not static, and the constant shifting between foveal and peripheral vision gives dimension and comprehension to a space. For architectural lighting this knowledge is important because our eyes unconsciously move towards the brightest thing in our direct field of vision, and things on the periphery need to be clear so that we have a good cognitive grasp of the space and how to move through it. This means that lighting vertical surfaces is important, a fact that is frequently ignored in many lighting designs. Russell explains that the job of the photographer is to use the camera to condense the dynamic experience of the space into a more static one, as shown in the example below. The practice, craft, and technical approach to architectural photogrtaphy is crucial to the practice of architecture as we understand it today. All most architects have left at the end of a project is photos, and many more people experience the built environment through these graphic interpretations of architectural spaces than actually experience the actual architecture in real life, and architects depend heavily on these images to communicate their design capabilities, style, and approach to building. Lighting designers play a huge role in how the buildings are experienced, and how they photograph. A deep understanding of what happens to the space in the camera is therefore extremely useful to lighting designers. Russell also explains how he applies what I call “makeup” to architectural spaces in order to compensate for the declining differences in dynamic range between our eyes, the camera, display devices, and printed materials. Basically, some compensation in lighting is usually required because the camera can’t replicate what we experience in person in a space. So the lighting may be balanced perfectly for human perception, but some magic combination of slight fill light and post production editing is often necessary in order to most closely convey the actual experience of the space. I was very fortunate to work with Russell in 2013 in a series of experiments in the studio where we wanted to test the comparative color rendering capabilities of two 3000K MR16 LED light sources- the Soraa 95 CRI and a Philips 80 CRI. We simply set out to replicate two shots exactly using only the LED light sources, which were arranged in banks of 12 and positioned in exactly the same spot for each comparative shot. Most traditional product photography is done using Xenon or tungsten light sources that are either 3000K or 5000K. In order to create warmer color light, photographers start with the high CCT source and use combinations of filters to get the effects they need. Naturally with the evolution of LEDs as light sources for many application, this is changing so that photographers can have any original light source they need without being constrained by filters or specific spectral power distribution of a single reference source. What we found was really interesting, in general the color rendering replicated what we experienced with the eye, and by comparing the photos side by side we were able to articulate the perceptual differences by referring to the histograms. In real life you never see the same subject side by side under different light sources, so this early work helped to establish the importance of high color rendering LED light sources in a way that was easy to see the difference. 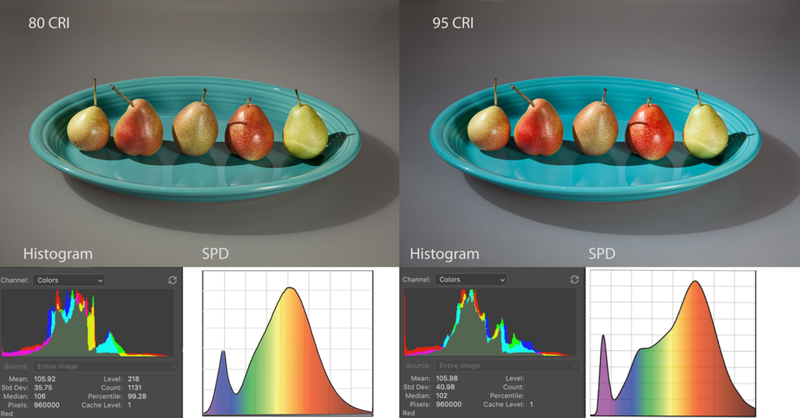 In the image below, which shows a plate of pears shot under both light sources, small differences in the Spectral Power Distribution (SPD) end up making significant differences in perceived color rendering. The histograms of each image as viewed in Photoshop are included for comparison. Histograms in Photoshop illustrate how pixels in an image are distributed by graphing the number of pixels at each color intensity level. The histogram shows detail in the shadows midtones, and highlights, and thus relate to dynamic range. Histograms help the photographer determine whether an image has enough detail to make a good correction. I have not done enough careful analysis of the relationship between SPD and histograms, but my main purpose here is to illustrate that photographers’ tools for analyzing light bear some important relationship to those that lighting designers use. For me, seeing Russell’s work again in a different light opened up worlds of possible exploration between architectural photography and architectural lighting. As a quick view of history shows, they’re inextricably connected, but with the advent of increasingly specialized disciplines in our ”modern” age, these connections are often forgotten or unknown. The crossovers and new potential discoveries aren’t just technical, they also deal with aesthetics, experience, perception, and behavior. We lighting people can learn a huge amount by collaborative research and experimentation with photographers, and vice versa. Please join us this Thursday at 5:30 pm at DPR Offices, 945 Front St. to see Russell and his partner Kristen Paulin explore these connections in detail. The event also features food, a hosted bar, and a showcase of the most innovative architectural lighting products on the market.